Its one-step at a time and Litecoin pace is slow but steady. 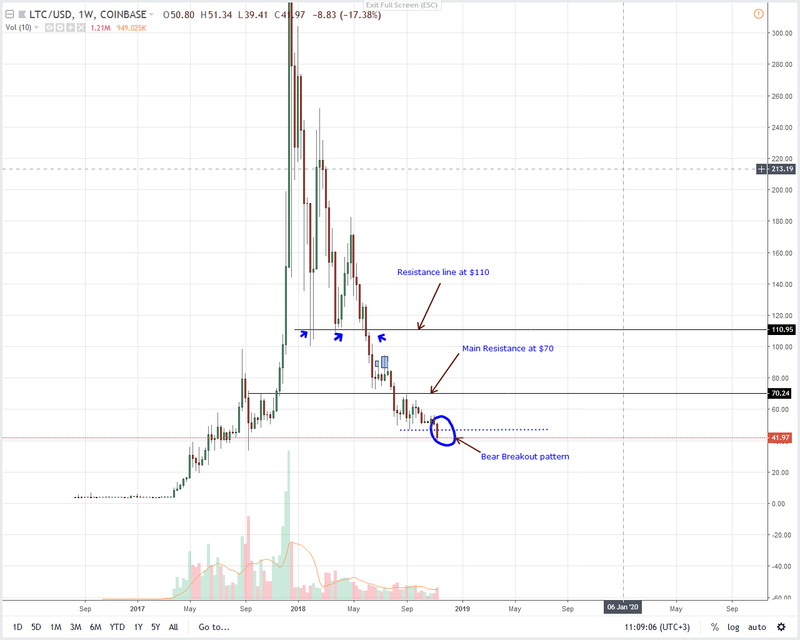 Even as prices drop to record lows printing at a time when Tushar Jain took to twitter thrashing Litecoin, the Founding Director of the Litecoin foundation and the owner of Litecoin.com has a different view of what the seventh most valuable coin represents. For one he really thinks Litecoin is a unique ecosystem, an independent network that has no business competing with Bitcoin but rather complement it. Regardless of low volumes, millions are still moved over the network with $62 million recently transferred for less than a dollar. Of course, this is mostly thanks to low transaction fees and bolder plans of further slashing fees by a factor of 10 once Litecoin core 0.17 goes live. Efforts like this will no doubt boost businesses adopting Litecoin as a payment method as Zulu Republic, a separate wing that promotes Litecoin to business, have an easy time promoting Litecoin adoption. In the meantime, the network is working towards resolving scalability. By forging a fruitful partnership with Lightning Labs, scalability is being worked on and at the same time prospects of atomic swaps sets the foundation of a future that is interconnected allowing for the seamless flow of different assets without the need of passing them through a central exchange. 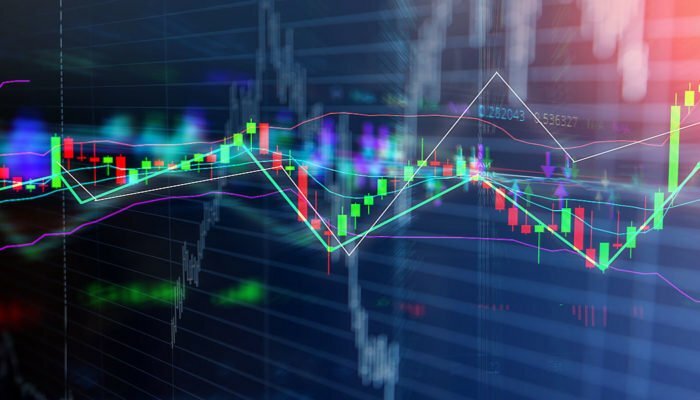 At seventh, LTC/USD is down 18 percent in the last week but stable in lower time frames. However, we anticipate more losses now that the drag of Bitcoin Cash internal wars did have an effect on other altcoins. By bears stepping up and initiating a sell off that saw LTC pierce and close below important support line now resistance at $50, conservative traders can as well begin dumping LTC with first targets at $30 in line with our previous LTC/USD iterations. This is despite LTC/USD already falling +80 percent from 2017 peaks. Besides, the breakout is printing at the back of high market participation—1.21m twice the weekly average of 600k. Fitting stops would be $50. 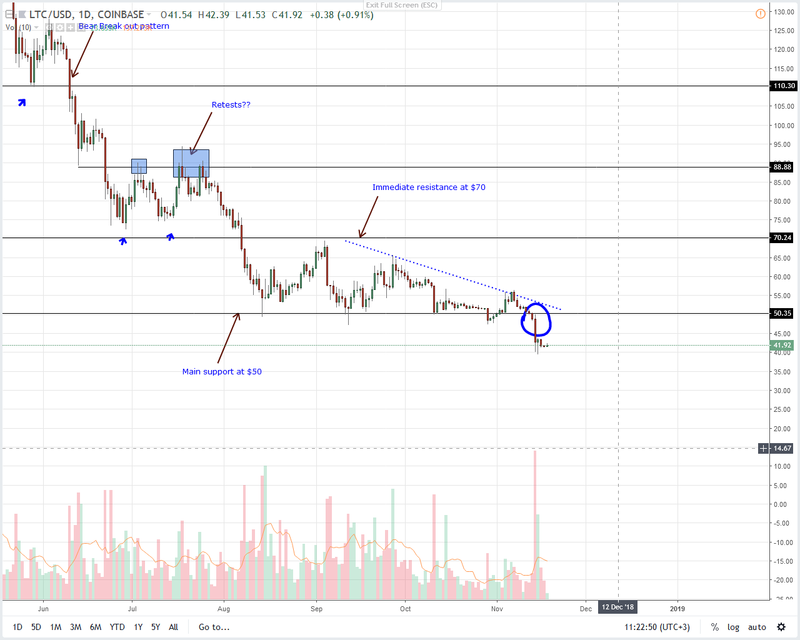 The 18 percent drop in LTC/USD was enough to trigger a meltdown driving prices below important support levels. Now with several bars closing below $50, the conditions set in our last trade plans are now live. Therefore, aggressive traders should jump in, shorting on pullbacks in the direction of the path of least resistance. Ideally, our first bear target is $30, another support level. At the same time, fitting stops should be at Nov 14 highs of $50. However, should prices expand and bulls surge above $50, then we shall revert back to neutral waiting for bulls to further thrust prices towards $60 igniting short term buys with targets at $70.